Math is like magic, except better! 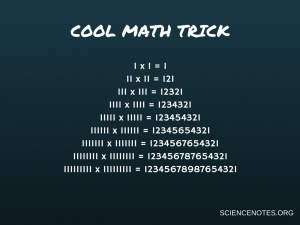 Here is a collection of cool math tricks you can learn to amaze your friends and learn more about how numbers work. Separate the two digits in your mind (6 __ 2). Add together the two digits of the numbers. (6 + 2 = 8). Place this number in the space or hole between the two digits (6 8 2). Take either of the numbers and double it. Add 5 to the result. Add the second number to your answer. Subtract 25 from the answer. You’ll get the 2 single digit numbers in the answer. There are many math tricks that ask you to supply a number to get a “hidden” number that you actually supply in a different form during the trick. 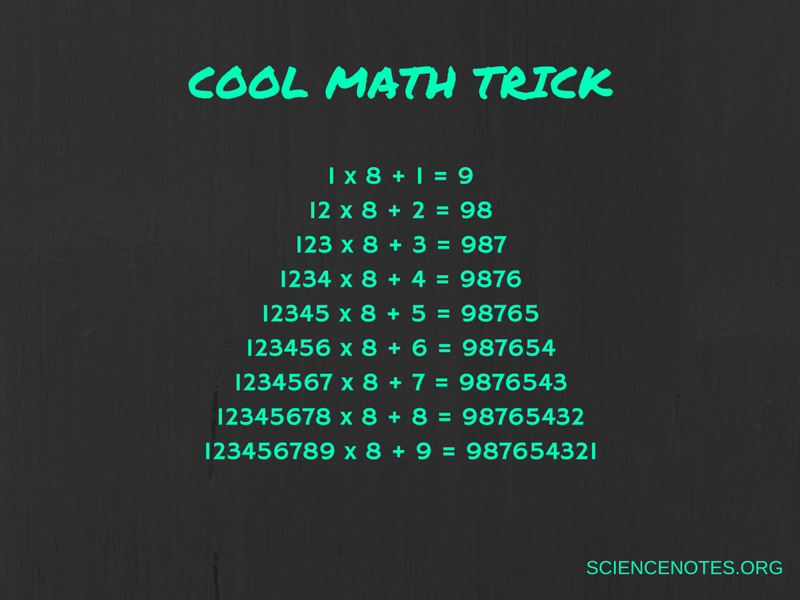 The first number isn’t too important, since it gets removed during the trick, so you can change the wording of this math trick. Use your shoe size to tell your age. Take your shoe size (whole number, so round up if it’s a half size). Subtract the year you were born. The first digit is your shoe size and the last 2 digits are your age. Why does it work (and why does it sometimes fail)? No matter what your shoes size is, it will be the first two digits of the answer. If your shoe size is 9, the 100s is 900. If you use a European size chart and wear a size 36, then 100s = 3600. The age part takes the current year minus your birth year. The trick does not take into account your birth month, so if your birthday this year has not arrived, the answer will be a year off! Choose a number between 1 and 6. Multiply the result by 111. Multiply the answer by 1001. The answer will contains all the numbers 1, 2, 4, 5, 7, 8. The number of letters in each word is the digit, giving you 3.141592. Arrange the digits in descending order. Reverse the order and subtract it from the number in step 2. Reverse the order of the answer. Add it to the result from step 3. You get 1089! For example, let’s say I chose 423. For example, the number is 245. Arranged in descending order it’s 542. Reversing the order is 245. Add 6 to your answer. Divide the new number by 3. Subtract your original number from this one. For example, the number 2345. Multiplied by 3, it’s 7035. Dividing by 3 gives 2347. Subtracting the original: 2347 – 2347 = 2. Think of a 3 digit number where all the digits are the same (e.g., 333, 777). Divide your 3-digit number by the added value. Whenever you multiply 6 by an even number, the final digit in the answer will be the same, while the digit in the tens place will be half the digit in the ones place. 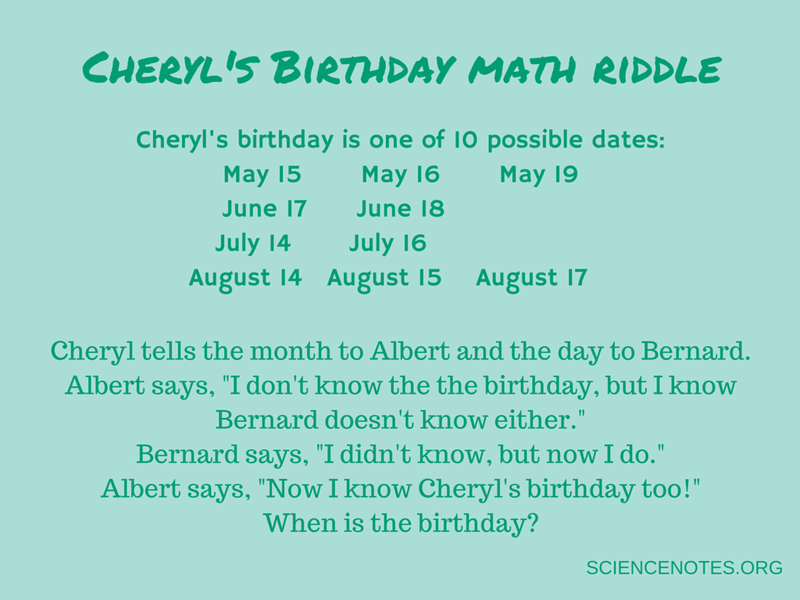 “Cheryl’s Birthday” is more of a math riddle or logic puzzle that is solved using the process of elimination or deductive reasoning. Albert can’t know the birthday because he only has the month and all months have multiple dates, but he has enough information to know Bernard does not have the date. If Cheryl had told Bernard 19 or 18, then he would know the whole birthday because there is only one month with each number. This rules out May 19 and June 18. Since Albert knows Bernard doesn’t know, Albert must have been told July or August, as this rules out any possibility of Bernard being told 18 or 19. This excludes any dates in May or June. When Bernard says he did not know the answer, but now he does, this means Bernard has the one remaining unique number in the list. If Bernard had a 14, he wouldn’t know whether it was in July or August. If he had a 15 or a 17, he wouldn’t know which date in August was correct. Thus Cheryl’s birthday must be July 16! If you want to get really tricky, you can rephrase the riddle to say Bernard starts out saying he doesn’t know when the birthday is, with Albert replying he doesn’t know either. If Bernard then says he didn’t know, but now he does, and Albert replies he now knows too, then the answer is August 17. Can you see why? 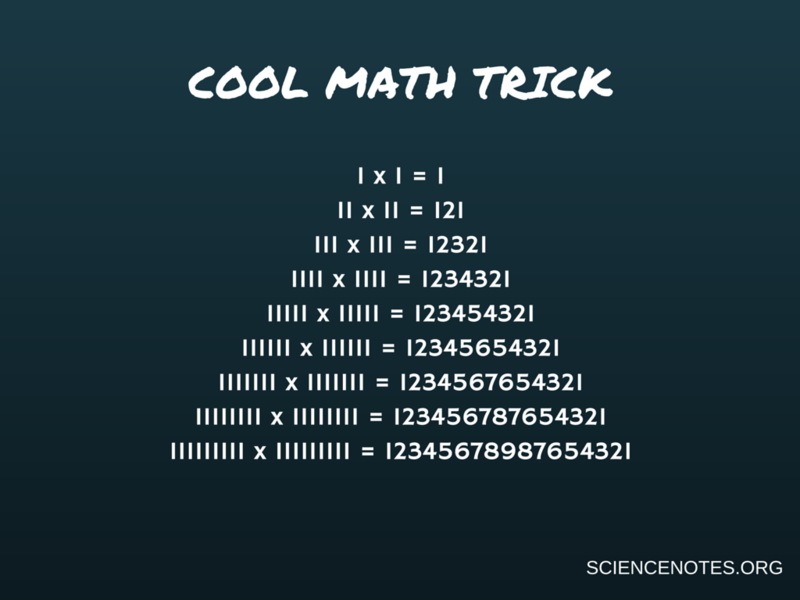 Do you have other cool math tricks to add? Post a reply and share them!